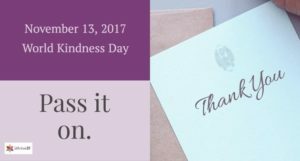 World Kindness Day is Nov 13, 2017. Here are 10 practical ideas to honor its intent. (Remember, you can use these ideas on other days too). Send a personalized note card to each of your employees letting them know you appreciate them; put in on their desk before they come to work. Spring for a Pumpkin Spiced Latte (or another treat) and personally deliver to each of your staff. Tell your team in honor of their hard work, everyone gets to leave 2 hours early. Buy your boss’s administrative assistant flowers/candy and let him/her know how much you appreciate all they do. Put a bag of bagels in the break room with a note sharing why you are grateful for the people you work with. Take your administrative assistant out to lunch and let them know they are invaluable. Reconcile with a peer whom you have had difficulties working with. Extend the olive branch. Start your staff meeting with…..”Before we get started I wanted to take a moment and let each of you know why I am grateful to be leading this team……(be specific, sincere and inclusive). Tell your team in honor of World Kindness Day you are taking them all out for lunch. Smile. Be kind. Don’t yell, argue or shout. Demonstrate courtesy. Hold the door, let someone cut in line and just be a nice person. Feel free to leave more ideas in the comments!